We are a living and lively church with a congregation that spans the whole age range from small babies to 90 years and beyond. At Castle Street you can be sure that you would arrive as a stranger and depart as a valued friend. We hope you enjoy visiting our website and find it useful, and that from it you will feel something of our desire to be a discipleship movement shaped for mission. May God richly bless you! Find out what to expect from our services. Morning Service with Sunday School and creche, followed by tea/coffee and conversation. 7pmJoint evening worship using resources from the Iona Community. 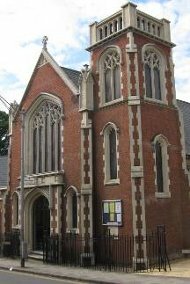 @St Luke's Church, Victoria Rd, CB4 3DZ No evening service at Castle Street Methodist Church. We meet at 7pm for a shared meal, then from 8pm for coffee, worship and discussion. Summer term focussing on "Talking of God Together"